I am trying to figure out what is going on with my 2002 EZGO TXT, last year I went to drive it and it was complete dead, would not move, no clicking from solenoid. I finally got back to it this year. I replaced the solenoid and still get nothing, I have 12 volts on the c and d terminals with the peddle pressed. I checked the fuse, it is good. The reverse buzzer is working. I am wonder what would be the next thing to look at? Just realized this is a gas cart. Starter brushes maybe if you are 100 % sure you grounds are good and you got 12 volts going to starter when you push pedal. Is so then tap the starter lightly and see if it will start. You can test starter using jumper cables to starter. Positive cable to F2 on starter and just ground the negative cable on the ground terminal on starter. I do not hear any clicking from the solenoid, is that right? I will try and by pass and go directly to the starter. Should I be getting 12V to F2 on the starter when the pedal is pressed down? Yes. Battery voltage to F2 when pedal is pushed with key on. Also you should hear that click from solenoid when you push pedal. You have two small terminals on the solenoid. One is ground . Take a jump wire and go from negative side of battery to the one that is grounded. If it clicks then you have grounding issues. You can't miss it as it is the only small terminal that has one black wire on it. The other small terminal has 12 volts when you push pedal. Three wires going to it. Do you hear the micro switch click when you push pedal ? EZGO installed these male terminals on the solenoids where you can just push the wire terminal on. I have seen people leave these terminals off. 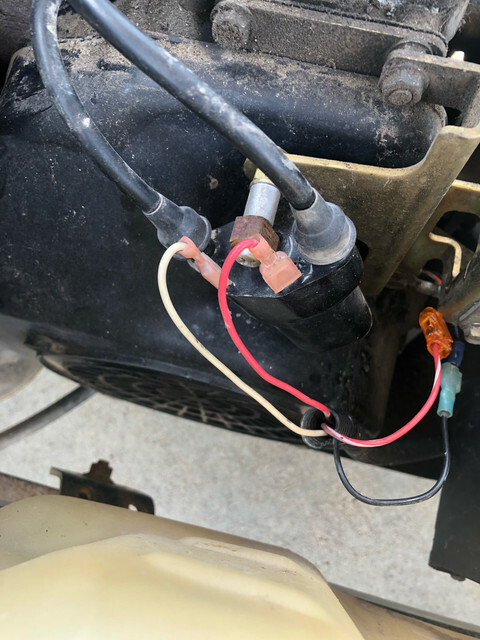 Next person that installs say a voltage regulator or ignitor and not have these male terminals will twist the small nut and break the solenoid inside. There are two nuts on each small terminals if you look. You will have to hold the bottom nut with a thin 5/16th end wrench . If one doesn't do this then you sometimes will break it like I said inside the solenoid. I have actually took them apart and soldered them. She turns over now! But won't start, I tried to use some starting fluid to see if was a carb issue and no go. I checked the wires to the coil and I am getting 9.3 V on one and 1.3 on the other. (Before the coil) Does that make any sense? I pulled the plug off and turned it over, i am not seeing any spark. What did you find on why it would not turn starter over ? If all is correct then with two wires that plug on male terminals of coil connected then your test light will flash when spinning over. I just pull the wires off enough so they still make contact with coil terminals and stick a test light on it. There is a black wire with white stripe that comes from ignitor. It has to be grounded. I think my picture showed it. I will show updated picture with wire that needs grounded from ignitor . If not correctly grounded then your test light will not flash. Check that and post back. I have seen many a time that ground wire come off or not pushed on good enough to make a ground. Hello again! Thank you for helping me figure this out, it is VERY much appreciated! So I checked the black wire with the white stripe, it seems to be good. 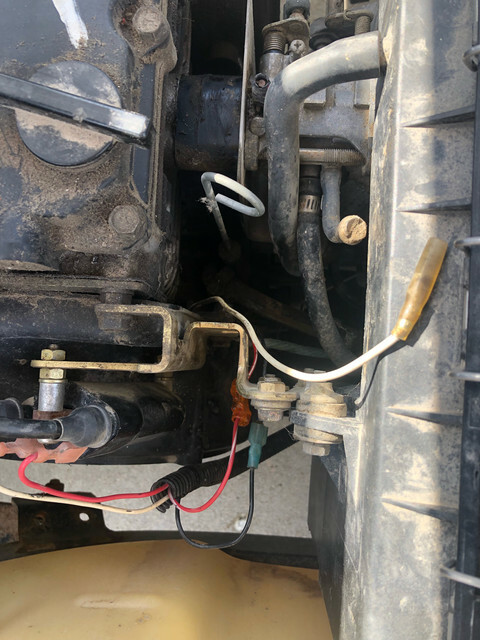 I put the test light on the coil, on one of the terminals I get one blink and nothing more, on the other terminal i get a solid light when turning over the engine. I also bought an inline tester for the spark plugs (https://www.harborfreight.com/In-Lin...ker-63590.html) , I get nothing on either plug when I plug this in to either plug. Bad coil? I did see a loose wire (white) behind the coil that isn't attached to anything (I don't believe it ever was).